P.S. In the tutorial we use Photoshop CC 2018. 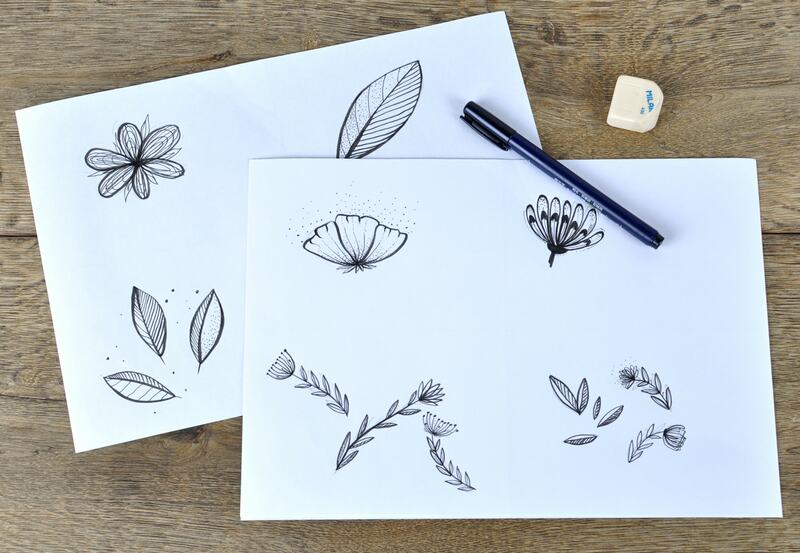 We draw a floral pattern, but you can let your imagination run wild 🙂 Let’s start! 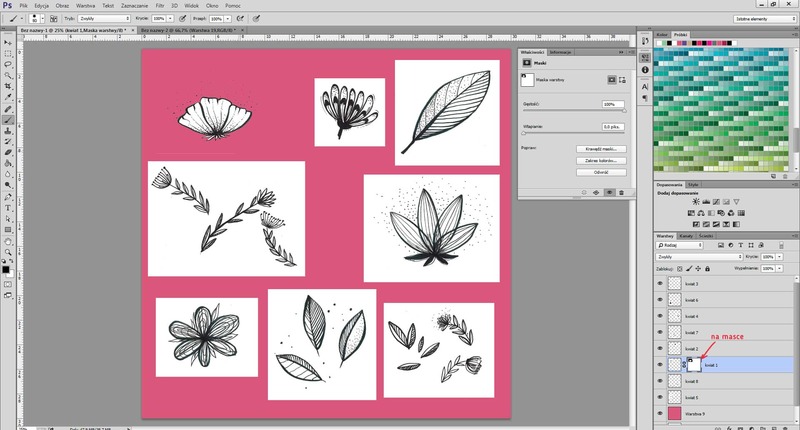 Draw a few elements on a white sheet. 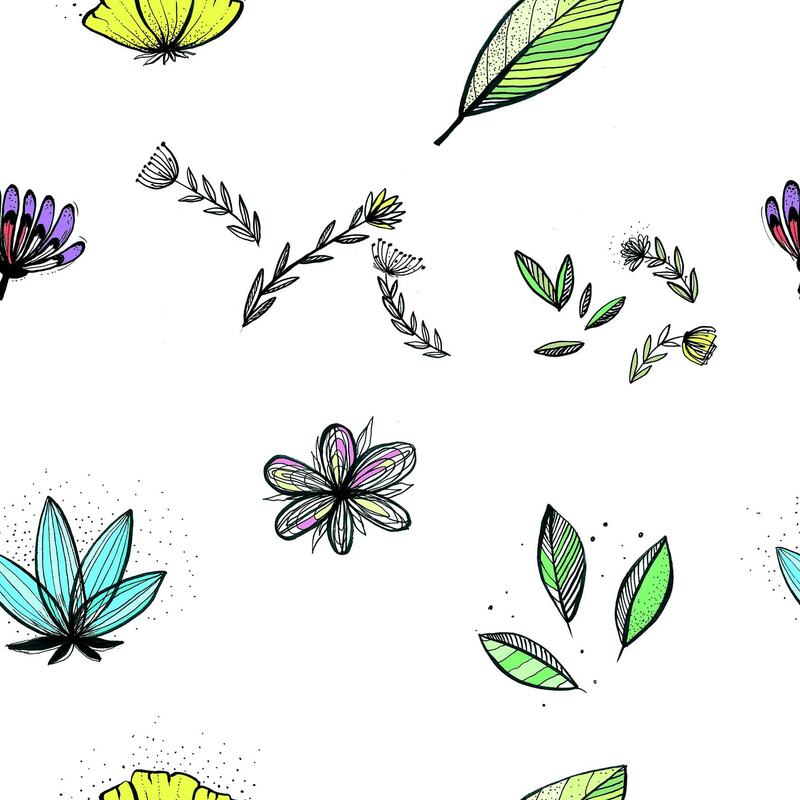 We’ve chosen flowers – there’s nothing better than a light floral pattern. Feel free to draw anything you want. Use a thick black marker to facilitate scanning – scanned images look better when elements are clear. If you use a pencil to sketch a drawing, remove it before scanning. Then, scan your image at the resolution of 300 dpi. Now some technical guidelines – set proper file parameters. 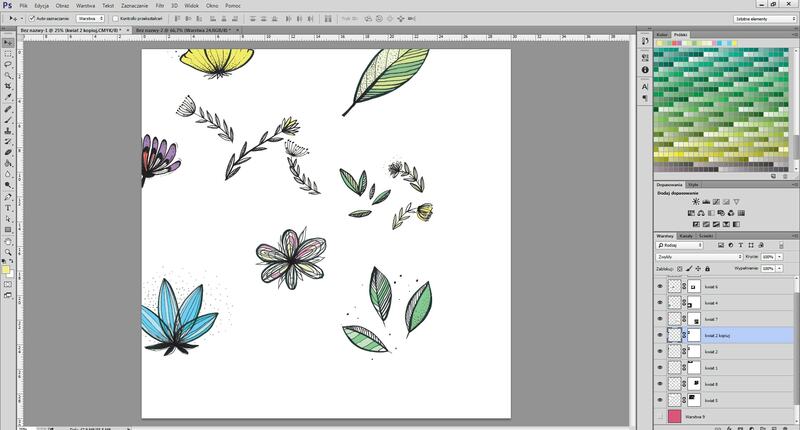 Create a new Photoshop file at 300 dpi. We prepare a 30×30 cm file that in pixels has a size of 3543×3543 px. Note that the file should be at minimum 150 dpi. If you would like to print it on paper or fabric, you should choose CMYK as a color model. Upload your graphics into your file. In some Photoshop versions, when you upload an image into a document, it automatically becomes a smart object. You can’t simply edit such an image. If you want to change it, you need to rasterize the image layer by clicking the right button on it. Next, choose Rasterize Layer. Now let’s improve the scan quality – set the levels appropriately to make the image clear enough. Use the left slider to make the image dark and the right one to make it lighter. You can find this function by choosing the Image > Adjustments > Levels command. 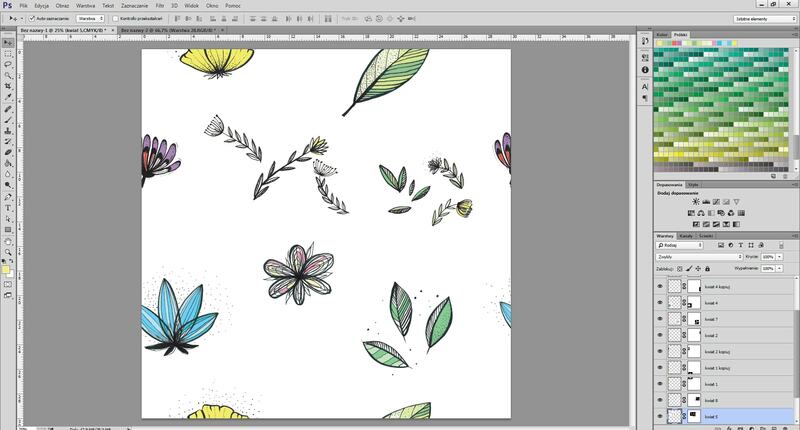 Cut all the image elements from the layer ( in our case, flowers) by means of Rectangular Marquee Tool. It is used for marking image elements. Then, click on CTRL+J to cut an element – now it becomes a separate layer. Reapeat the same procedure with all the elements and turn off the layer with the scan, leaving only the flowers. Add a colourful layer under the elements to make them visible. 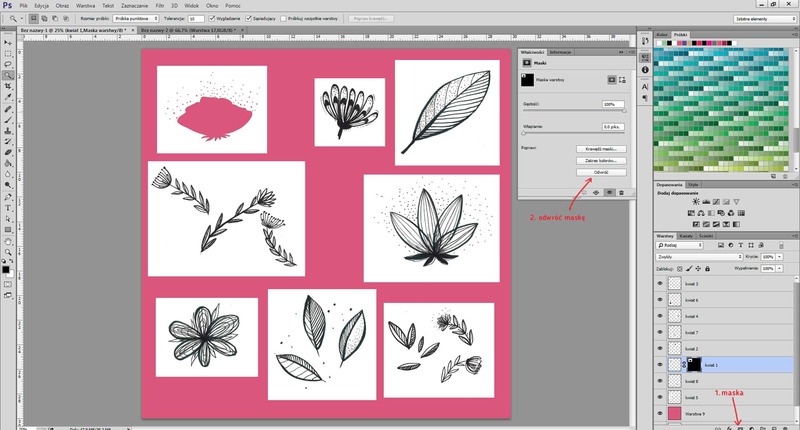 Next, select Magic Wand Tool in the panel on the left and mark white background on the layer with the element. Now add a Layer Mask (see the picture) and invert it. Repeat it with all the elements. Now use the Brush to remove all the remains from the mask of a single element. The black Brush covers and the white one uncovers the image. Repeat the same procedure with all the pictures. 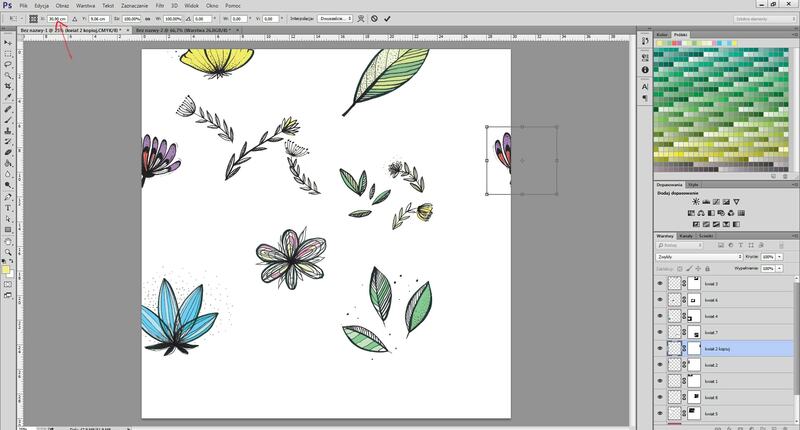 Colour the middle of the flower elements by using the Paint Bucket Tool. Remember to select a particular layer where the element is located. Paint the rest of the elements in the same way. Turn off the bakcground layer (in our case, the pink one but you can choose a different colour). 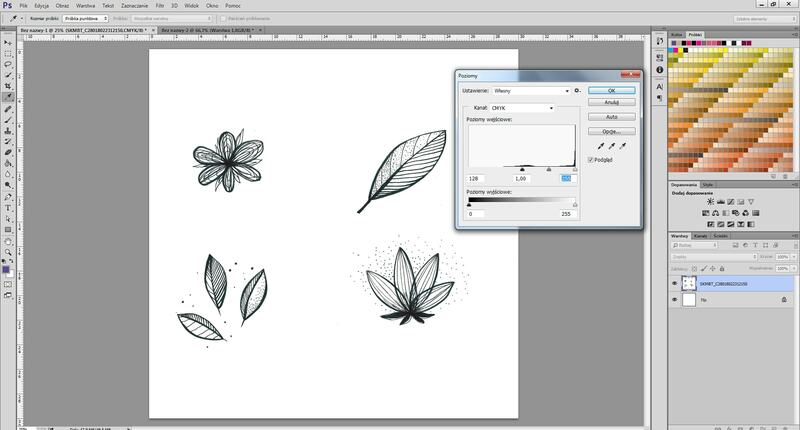 Shift some of the elements to the top and to the left edge of the file. They will be placed on the opposite side of the file. These are the terminal elements of the pattern. Choose centimetres on the Ruler Tool at the top. 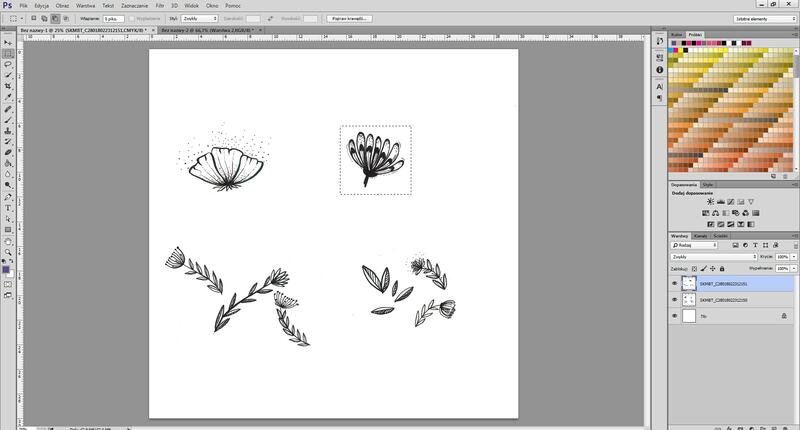 Next, copy the layer with the element (the flower) on the left. Press CTRL+T and change the position of the copied element on the X axis (the horizontal one) about 30 cm. The tools for changing the position of the element can be found in the top left corner (see the picture). Do the same with other terminal elements. After that, repeat the same procedure changing the position of all the elements on the Y axis (vertical) about 30 cm. Please note: the position should be changed about 30 cm because the size of our file is 30×30 cm. Here you need to consider the size of your file. Create a composition by rearranging the elements in the middle. There can be regular spacing or something totally wild. Then, the design is ready! Remember to save the file as a PSD with layers. It allows you to work on the design later on. What is more, it is a good habit to save your work regularly – it will prevent you from loosing data. Note that it’s the final file with the design! If you’d like to upload it into our application, save your design as TIFF (flattened with LZW compression), JPG or PNG at minimum 150 dpi. 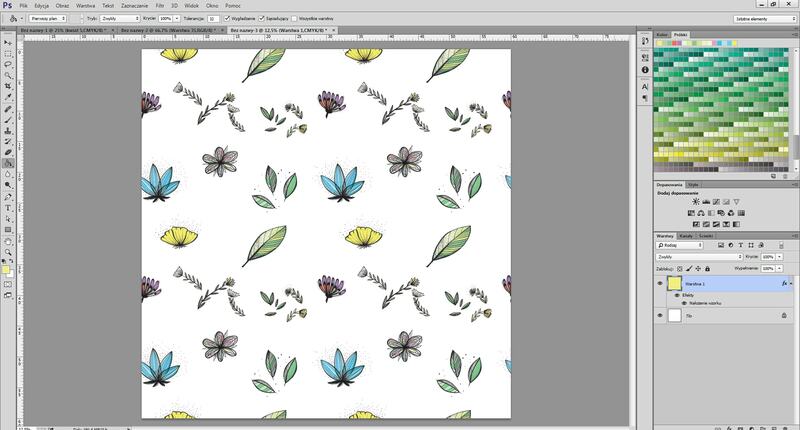 Before you upload your file, you can check if the pattern is seamless. Unfold the Edit menu and select Define Pattern. Make a new file, for example 50×50 cm. The size of the file should be bigger than the size of your design. 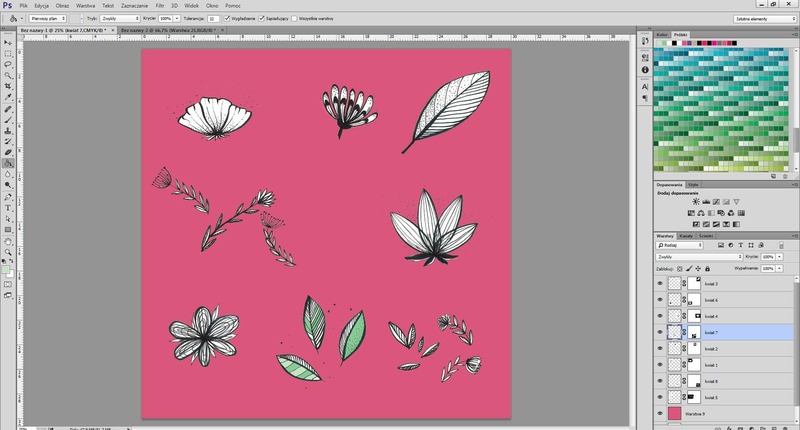 Add a layer in the new file and apply a single colour by choosing the Paint Bucket Tool (you can’t apply a design into an empty layer). 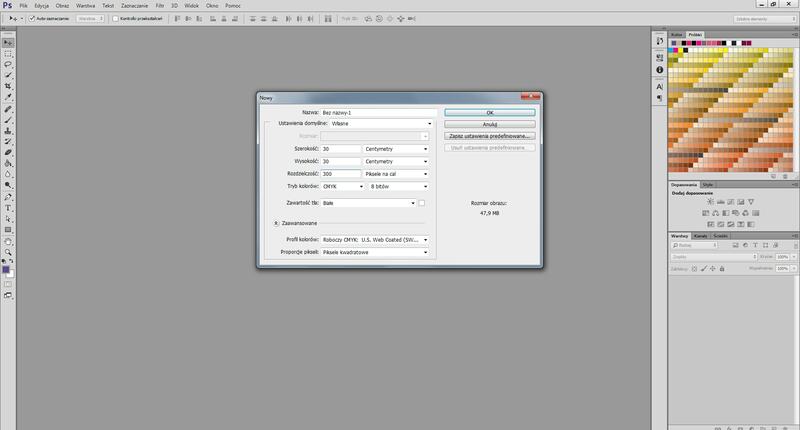 Next, apply the design on the colour layer by selecting Add Layer Style from the menu in the bottom right corner (fx). When you unfold the menu, choose Add Patterns and pick yours from the list. This is what your pattern looks like. Check if it is seamless. You can change the design at any time by editing the file. 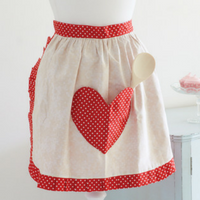 Please note: the file with the applied pattern is not right for print. It is only the preview of your pattern. If you want to print your design, use the previously prepared element. The file that has been prepared for printing can be uploaded into our application and after choosing a fabric type, printed on sewing fabric! And now it’s time for a SURPRISE! 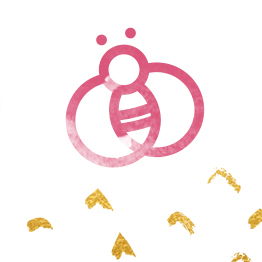 If you are fancy to print your own design at CottonBee, but want to play with an already made design, we have something for you. 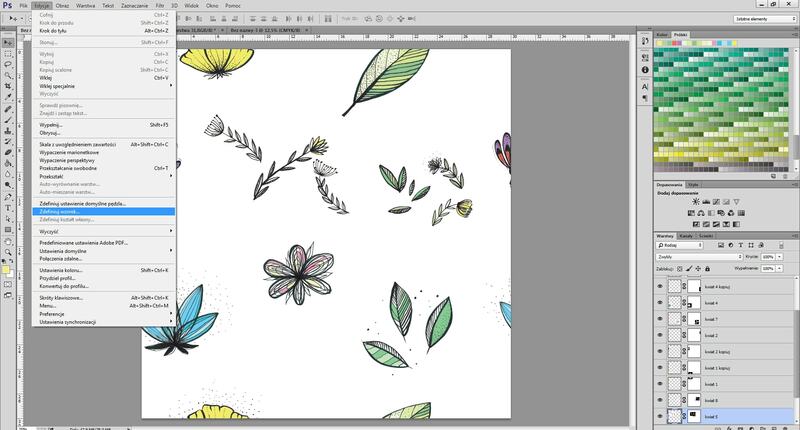 You can download our flower pattern from this tutorial and upload it on our website! DOWNLOAD THE PATTERN. Now try to change the size of the pattern in the application, play around with pattern repeat. When you are sure that settings are right and suitable for your project, just choose what fabric you want to print your design on and set up the order size. We start printing at 10×10 cm swatches! Pssst… ordering a swatch is a good way to start. You can check if you like the colours before you order a greater amount of fabric! Do you design your own patterns? Perhaps our tutorial has helped you with your first project? Share it with us at our Facebook account!